BBC NEWS | Asia-Pacific | Is North Korea facing famine? Is North Korea facing famine? North Korea is said by some international observers to be on the brink of famine. The United Nations World Food Programme estimates that the country is more than one million tonnes of grain short of what it needs to feed its people this year. 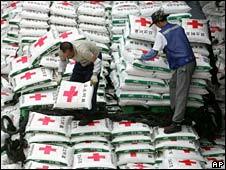 The United States has agreed to send half a million tonnes of food aid. But with the first shipment due to arrive some time in the next few days, how much is really known about the nature of the food crisis inside one of the most closed countries in the world? North Korea makes no secret of the fact that its people's plates may be far from full. 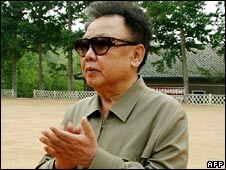 State media quotes the country's long-standing leader, Kim Jong-il, as insisting that the issue be given top priority. "Nothing is more pressing than solving the people's food problem," he is reported to have said on a recent visit to a farm in the north of the country. North Korea has long suffered from serious shortages - the centralised economy is notoriously inefficient and the distribution system is failing. North Koreans are noticeably smaller and thinner than their vastly richer and better fed South Korean neighbours. But in 2008 the situation has been made much worse by the serious flooding that hit last year's harvest. Some people are predicting that the country is about to experience a famine on the scale of the one that claimed up to one million lives in the mid-1990s. The South Korean human rights group, Good Friends, is affiliated with an aid agency that has access to North Korea. It has been making alarming claims about the current levels of hunger. "More deaths are coming from the rural farming community because, essentially, they have nothing to eat," their spokesperson, Erica Kang, said. 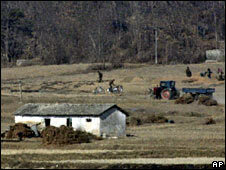 Based on testimony from North Korean officials, the group claims army personnel are beginning to desert, the ration system is breaking down even in the capital, Pyongyang, and citizens have been shot for trying to cross the Chinese border to escape the hardship. The South Korean government dismisses claims that things have got this bad. It has recently promised to send 50,000 tonnes of corn, but has so far held off from offering the large-scale aid donations made in recent years. Marcus Noland from the Peterson Institute for International Economics, a Washington based think-tank, has written one of the most comprehensive studies of the mid-90s famine. "It is very difficult to calculate the overall food shortfall in North Korea," he says, "and there are very large margins of error." Mr Noland believes that the World Food Programme has consistently overstated the amount of aid North Korea needs. But he points to one very telling indicator, the sky-rocketing prices that North Koreans are paying for rice and corn on the black market. A sure sign of widespread food shortages and hunger - and perhaps the portent of famine. But while observers disagree about the extent of the crisis, they have even less knowledge of its distribution. North Korea's tight controls grant very few opportunities to travel outside of Pyongyang for foreign diplomats or aid workers. Very little is known about which part of the population, rural or urban, is suffering the most and in what part of the country, north or south. It may be that even the North Korean government is unaware of the full extent of the crisis, despite Kim Jong-il's exhortations mentioned above. There is evidence that during the last famine the ruling elite were shielded from the true picture. A system that proffers harsh punishment for administrative failure does not tend to encourage bearers of bad news. Lies percolate upwards. But the arrival of the first wave of American aid will create an opportunity to grasp a better understanding. The food was sent with one condition - that independent monitors be allowed into the country to assess the situation on the ground. For the past week a team from the World Food Programme, accompanied by staff from US aid organisations, has been travelling to schools, hospitals and individual homes across North Korea. The observers are few in number and their assessment will be rapid, but nonetheless, it will be a rare glimpse, at least in recent years, of everyday life and how people are coping. Their report will be made public in the next few days.